After posting my Easy Salsa Verde recipe, I received a few requests for a red salsa, or Salsa Roja. I decided to go with our Award Winning Thai Salsa. My hubby entered a Salsa contest at work last year and we came up with a Thai inspired roasted salsa. It’s actually not a crazy combination since there is a type of ‘Thai Salsa’, called jaew. It uses very similar ingredients to Mexican Salsa but made by pounding the ingredients together in a mortar. What makes this a Thai Salsa Roja is the secret ingredient, Fish sauce. You would not suspect there’s fish sauce in here, because you can’t smell it or really taste it, but it will give the salsa a nice umami taste. This salsa won first place in the competition and it was a blind taste test, so they didn’t know what the ingredients were. We both felt pretty proud, especially since that was the first time we had ever made it, and for a competition nonetheless. 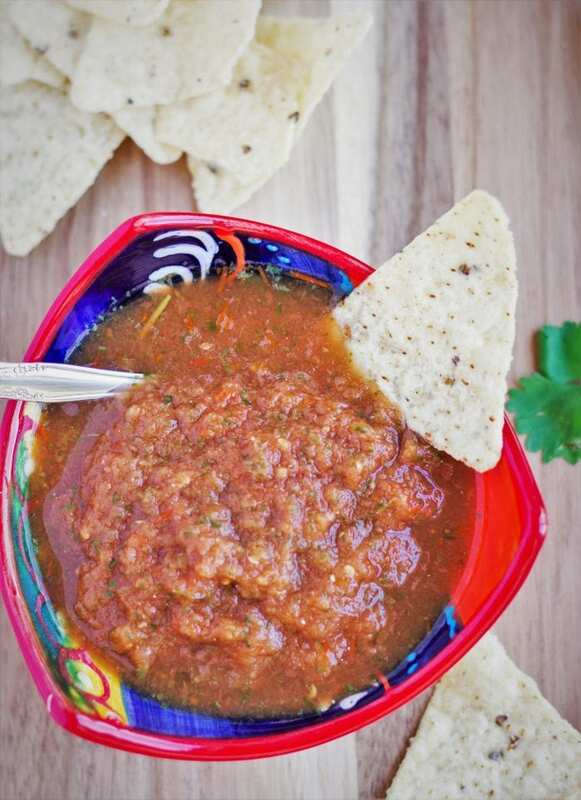 This salsa also has a nice smokiness since the ingredients are all roasted on the grill. You could definitely roast the ingredients in the oven, but if you want more smokiness then I suggest using the grill. I placed the Roma tomatoes whole, Garlic cloves, whole jalapenos, and white onion (halved), on a slotted grill pan. This was all roasted on the grill for about 20 minutes until the tomatoes and onion became soft. If you want to do this in the oven, you can place everything on a rimmed baking sheet and broil for a few minutes until the tomatoes and jalapeno become blistered. Allow everything to cool for a bit and place in a blender with cilantro, fresh lime juice, and fish sauce (the secret ingredient)! Blend to the desired consistency is reached and taste for flavor. I added a dash of salt to bring out more flavor. Place in a jar with a lid and cool in refrigerator. 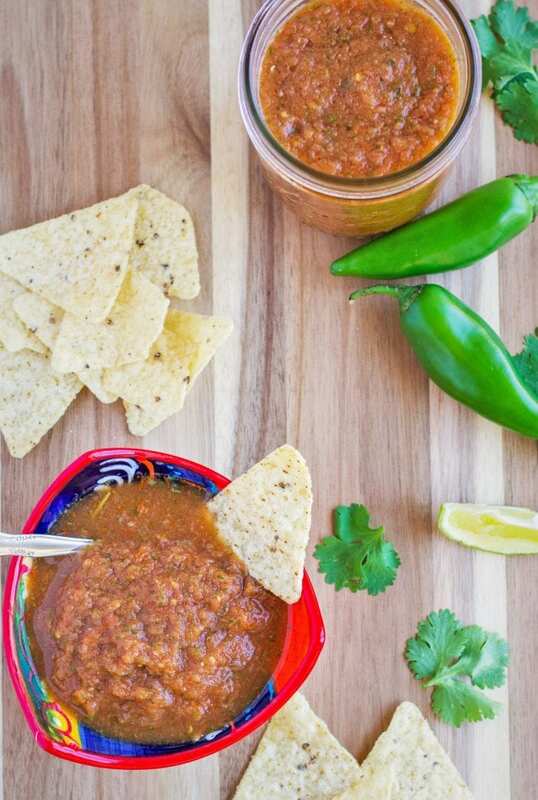 The salsa filled 3 pint mason jars, and will keep in the refrigerator for a week, but you’ll want this on everything! Place the Roma tomatoes whole, Garlic cloves, whole jalapenos, and white onion (halved), on a slotted grill pan. Roast on the grill for about 20 minutes until the tomatoes and onion became soft. If you want to do this in the oven, you can place everything on a rimmed baking sheet and broil for a few minutes until the tomatoes and jalapeno become blistered. Allow to cool and place in blender with lime juice, fish sauce, and cilantro. Blend until desired consistency is reached and taste. I added a dash of salt to bring out more flavor. Pour into jars with lids and place in refrigerator to cool. Airtight jars will store the salsa for about a week in the refrigerator. Thanks for the recipe. Can’t wait to give it a try. Looks like a recipe for my Red Boat Fish Sauce. Awesome, thanks Gary! What is your recipe for the Red Boat Fish Sauce?